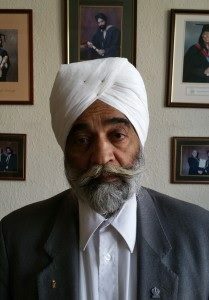 Worshipful Brother Sewa (Fred) Singh Nandhra, apart from his Masonic duties, has also devoted his time to his community and has been awarded a BEM (Medallist of the Order of the British Empire) in this year’s New Year’s Honours List. He received the award for his humanitarian service to the whole community and continuous commitment to helping those in need, regardless of their race, caste, creed or religion. Originally born in Kenya, of village Pattar Kalan, Dist. Jalandhar, Punjab, he accepts the award on behalf of all of the supporters and volunteers. He said: “I offer my sincere appreciation and thanks to my nominees. I dedicate this award to my family, parents, citizens of the whole village of Pattar Kalan, friends and foes alike. The official citation said he got his award for services to the community particularly in Woolwich. It read: “Whilst working as a Principal Building Control officer with the local council, he devotes much of his time for the community’s betterment. He works tirelessly, actively promoting equal opportunities, social inclusion and welfare including worldwide missionary activities with the Khalsa Parcharak Jatha International, and United Nations.